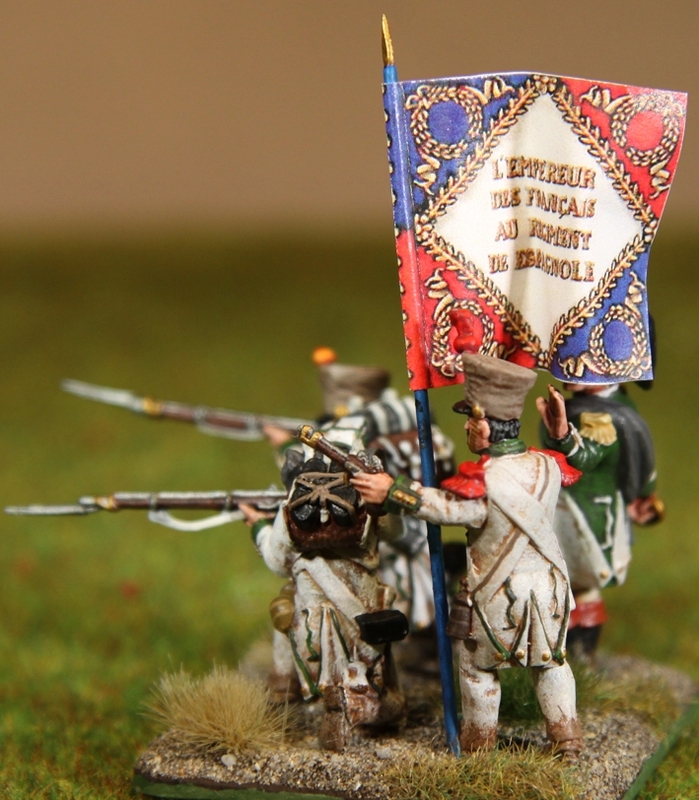 So here it is… the next French unit for my Völkerschlacht / Möckern project. 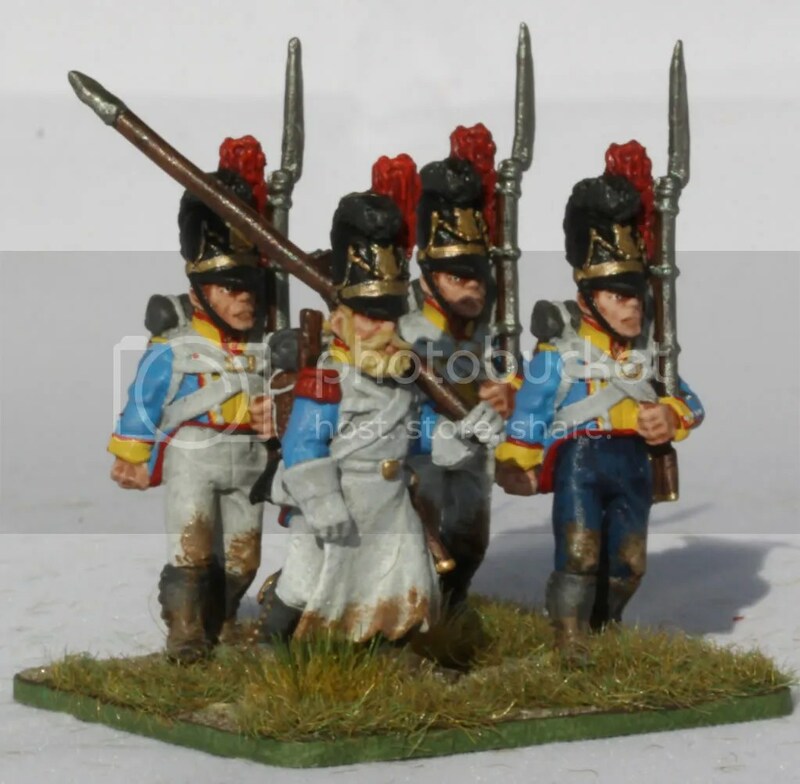 The Régiment Espaniol, also known as the Régiment Joséph Napoleon. Now it has quite an interesting history. 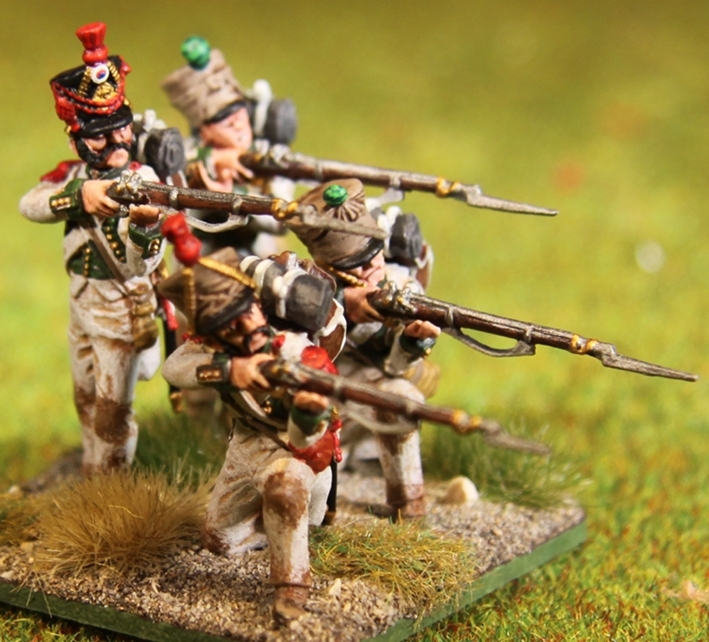 In 1807 the Bourbon Monarchs of Spain send an expeditionary force to serve in the Grande Armée. The around 10 regiments of all branches were split up and served in Denmark. They were still there when Napoleon forced the Spanish Bourbons to abdicate in 1808 and made his brother Joséph King of Spain. For most of the soldiers serving the expeditionary force this was disgraceful and an insult. So when their commander, the Marquis de la Romana, was contacted by a British agent offering transportation to Spain to fight with the allies, he accepted. Unfortunately he and his men were betrayed by one of their own regiments and over 3.500 soldiers became prisoners of war. Later that year the idea was hatched, that there would be enough men loyal to the French to create a unit to fight in the Peninsular. So by decree of 13th February 1809 the regiment was formed. 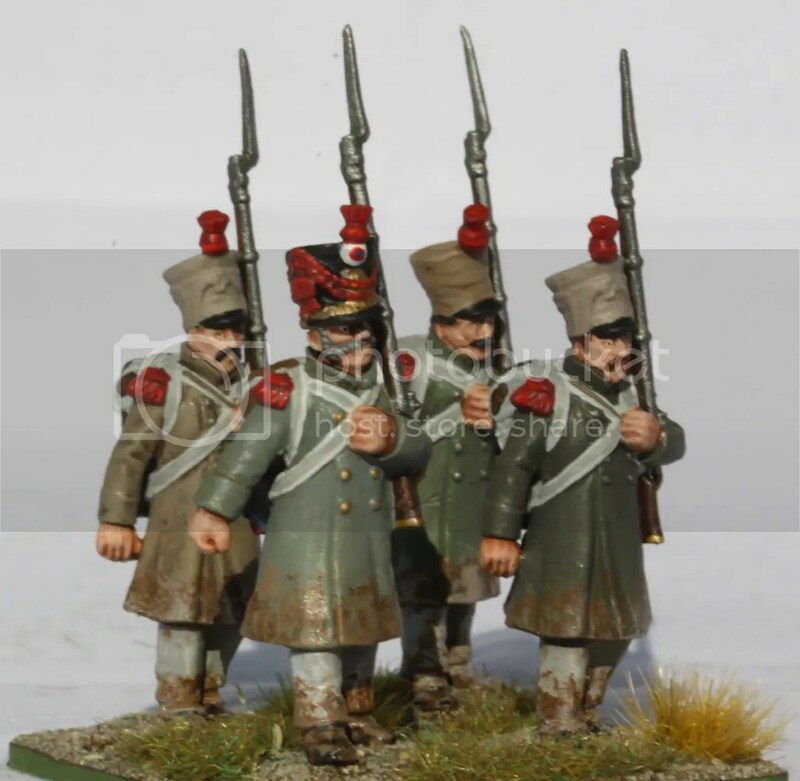 It consisted of four battalions (three Line, one Depot) all organized to French regulations with four Fusilier, one Voltigeur and one Grenadier companies each. The only difference was that the official language of command was Spanish and that their uniforms were of different colour (white with dark green breast). Formation was slow, since the French wanted to be sure that only those would serve, who would not desert at the first possible chance. So the Regiment was only completely formed by spring of 1810. But Napoleon still did not trust them enough. They were not sent to Spain after all, but split up by battalions and deployed to France, Germany, Italy and the Netherlands. During Napoleons invasion of Russia in 1812, the whole regiment took part. The second and third battalions as part of I Corps (Davout), first and fourth battalions as part of IV Corps (Prince Eugene). 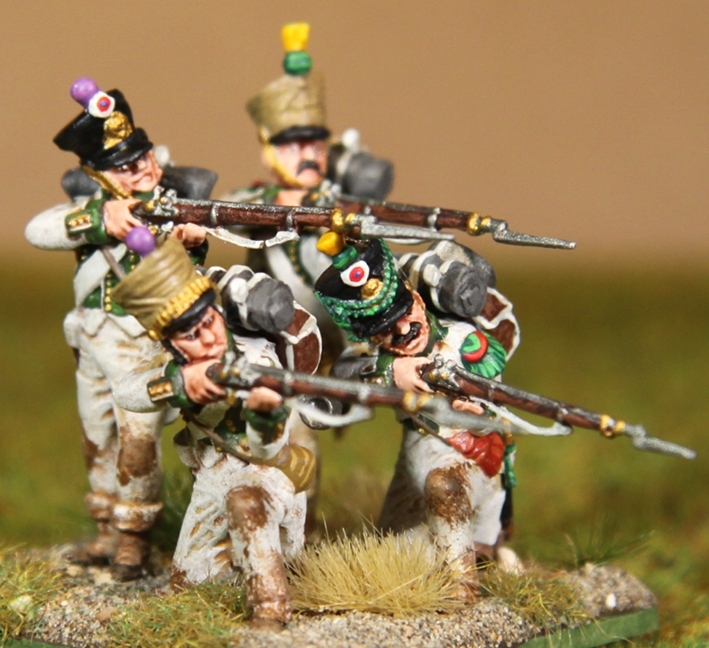 All four fought at Borodino, the third and fourth battalions taking part in the attack on the Great Redoubt. They were badly mauled in the retreat from Russia, just like the rest of the Grande Armée. They took part in the fighting in Germany in 1813, where they were decimated even more. So on December 24th 1813 the remaining troops had to surrender their weapons and were converted to a pioneer regiment, which was disbanded on 17th April 1814. So now on to the minis themselves. 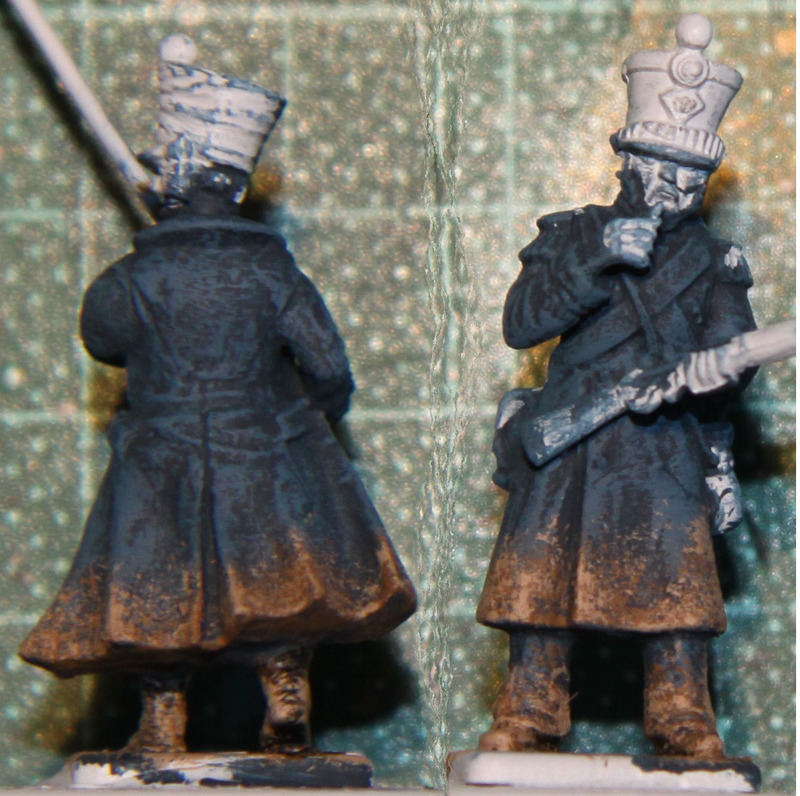 At first I had though about using Perry Miniatures for them, since they had been issued with Bardin uniforms after Russia. 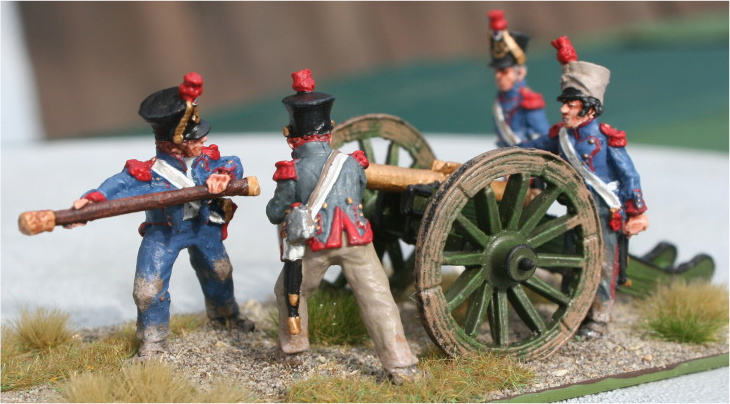 But on the other hand, they are not only useful for Leipzig, but even more so for Borodino. 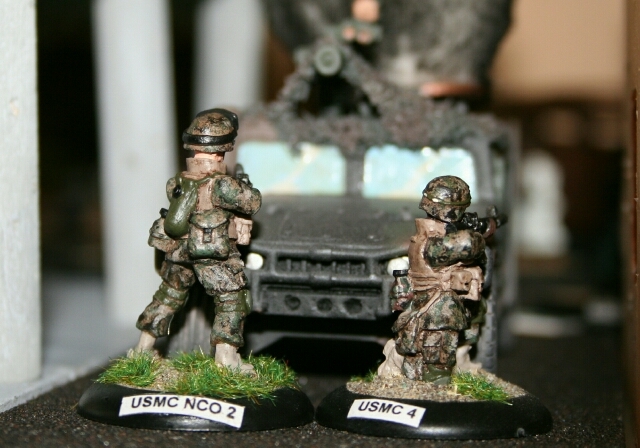 So in the end I wanted to keep the option open to expand these minis to use them for Russia. 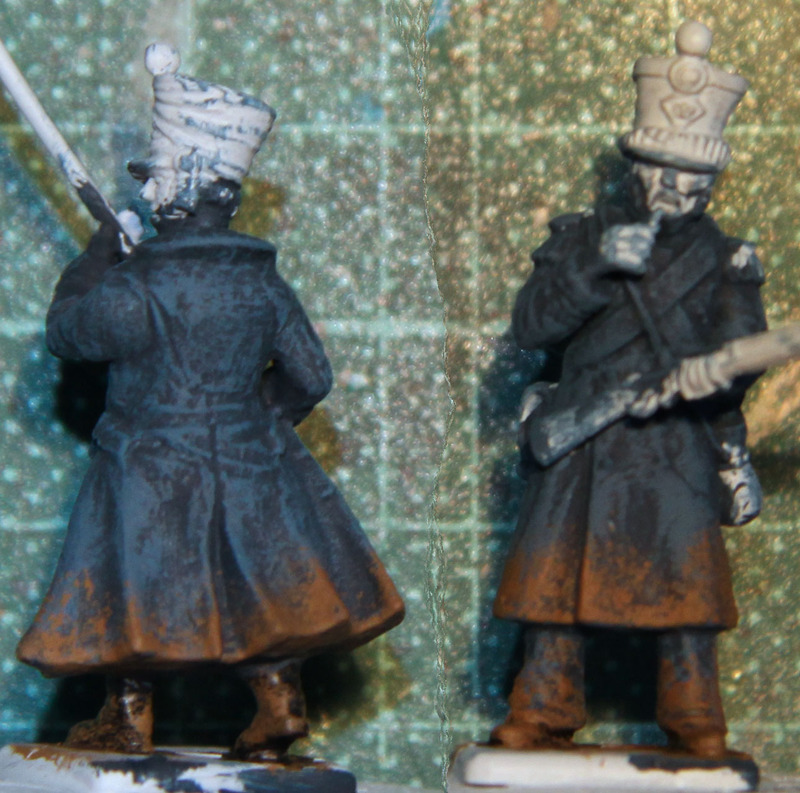 So I went for Victrix minis instead, although with a few Perry heads and arms. Flag is from GMB. I was quite stereotypical with the hair this time, as I went mostly for blacks and browns. 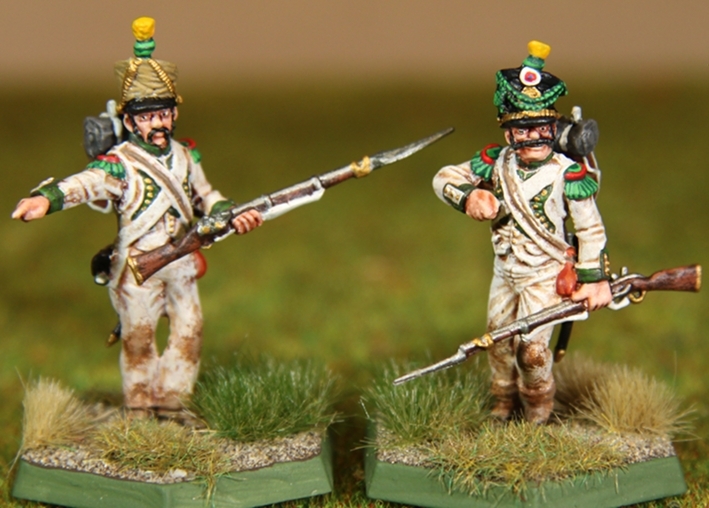 I also wanted to use these as testbed for Austrians, since their uniforms were predominately white as well. Usually I paint white uniforms in shades of light grey, with a final highlight of white. But here I went for creme tones, also with a final highlight of white. Not sure yet if I like it or not. The big problem in my opinion is that it a) looks a bit dirty (which is not too bad for the campaign look) and b) that the dirt around the feet and knees does not really come out. So let me know if you like them or not! 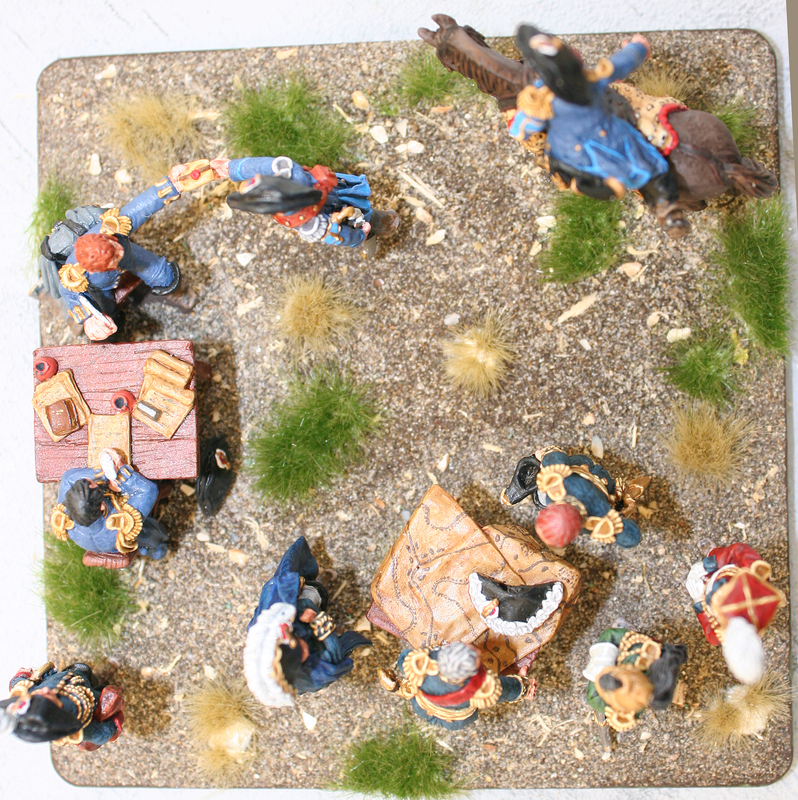 Over the past few weeks I have often been asked about my basing. I know that mine might not be the best looking bases around, but I think they are hard to beat when it comes to time vs. looks. So here is how I do it. First of all you need to prepare the minis and base. Most important is that you varnish the minis before the basing process. This has two reasons. 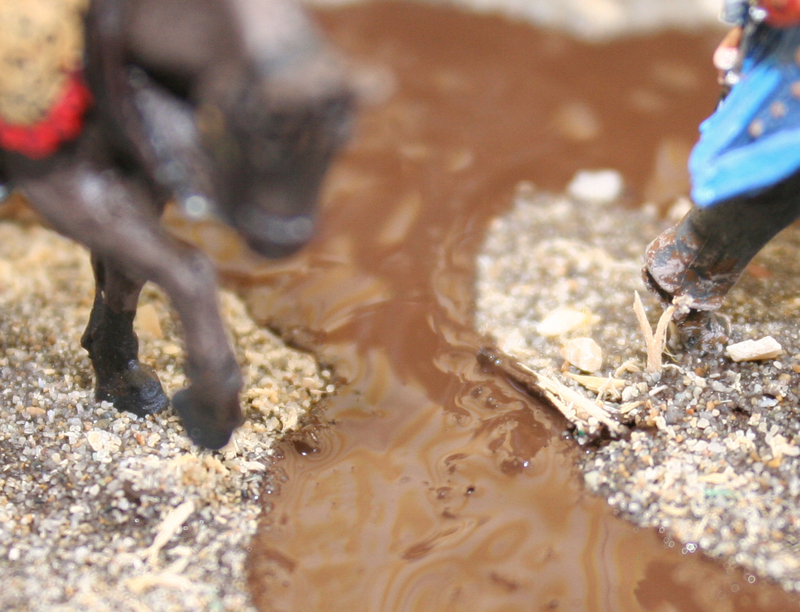 First… during basing the bases will be dipped into sand, so the minis will need the protection. 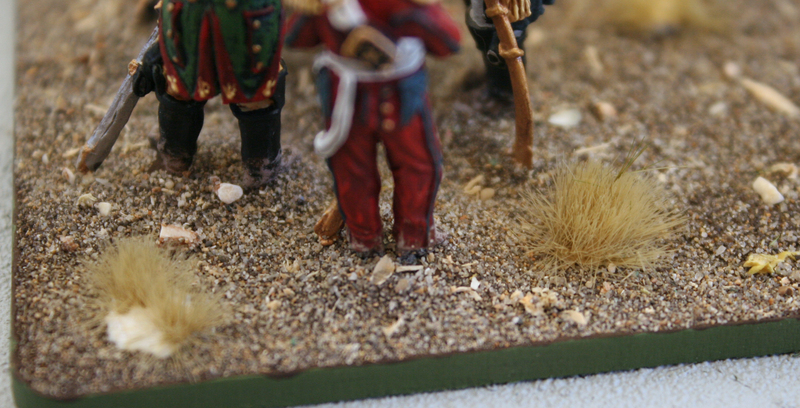 Second… after you are done basing there might be the odd fibre of static grass on the mini and you do not want that to be embedded in the static grass. Next comes the sand. I use sand that I took off a beach in Italy. Obviously that is not an option for everyone, so I will describe what it looks like. The grains of sand are about the size of grains is sugar or salt. Most of the grains are light in colour, some are dark. To keep with the kitchen analogies… like salt and pepper. To this I added some bird-cage sand. These grains are larger and quite light in colour. These will look like nice little rocks strewn over the ground. I also added some coarse saw dust. You can get this from any carpenter… for them it is just stuff they need to clean off the floor in the evening. But it will give the extra atmosphere to your base. Next up I paint the base in a chocolate-brown. I brush the paint on in liberal amounts, making sure that it gives a nice thick and especially wet coat. While this is still wet, I push the base into the paint. 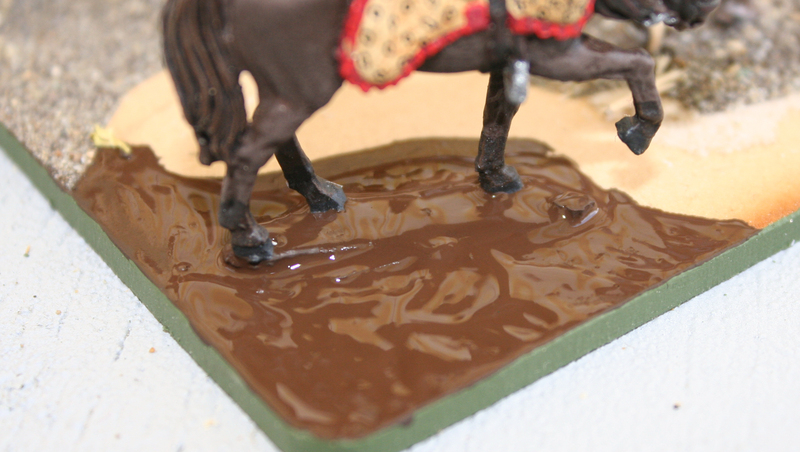 The wet paint will soak up the sand, tint it brown, and “glue” the sand to the base. If the base is too large to paint it all brown, before the paint dries where you started, simply split the base up in sections . Paint each section and push the base into the sand before you move on to the next section. Just make sure, that the sections do not take on geometric shapes, but rather have rounded and odd edges. At times an edge can show between the sections and you do not want that. 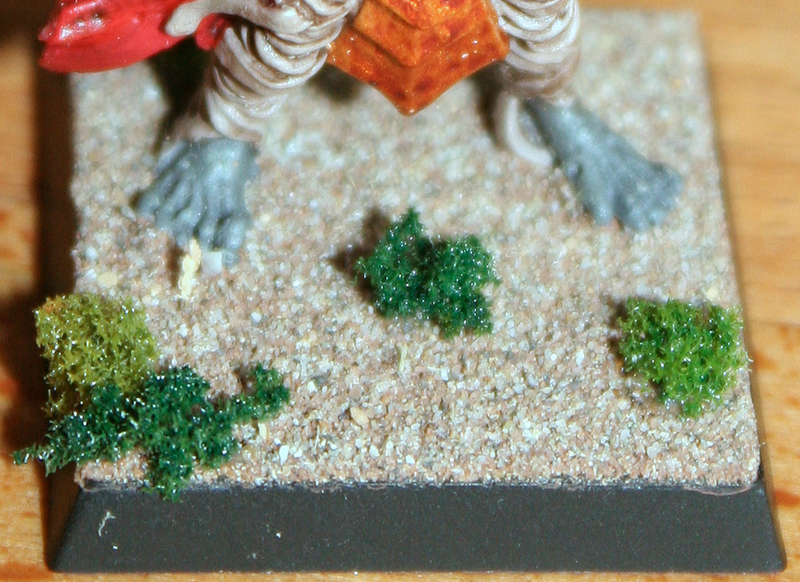 Next I add some Static Grass tuffs to represent the longer pieces of grass. I use two types. First some miniNatur “Spätherbst”. In the UK and US they are sold under the Silflor label and they should be the “late fall” type. Just glue them onto the base in irregular spots using white glue. 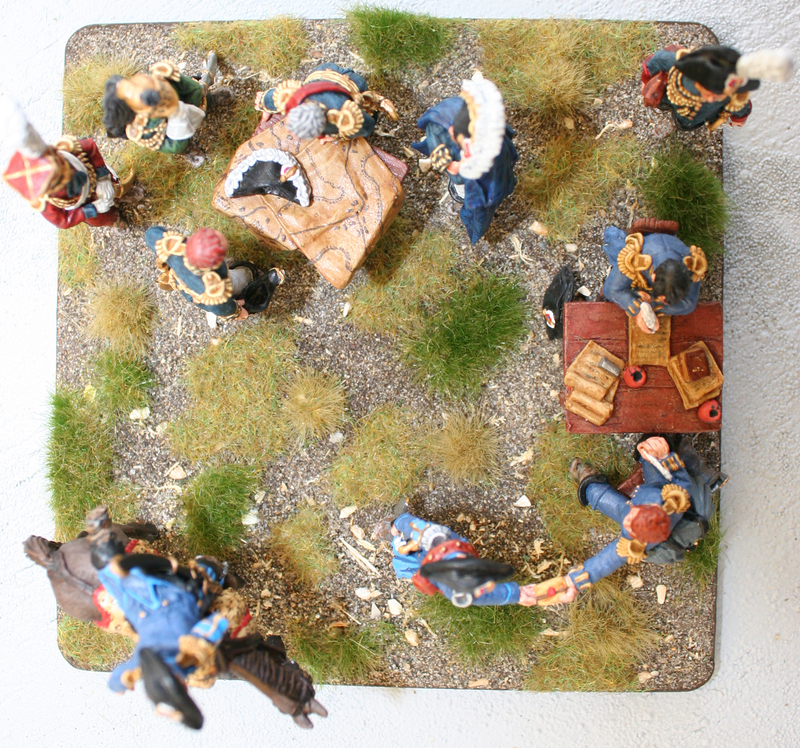 Afterwards, just repaint the edge of the base where you accidentally got some brown paint onto it and you are done.